Cryptocurrency Ethereum (ETH/USD) is trading at 134. Cryptocurrency quotes are trading below the moving average with a period of 55. This indicates the presence of a bearish trend on Ethereum. At the moment, cryptocurrency quotes are moving near the lower border of the Bollinger Bands indicator bands. As part of the Ethereum course forecast, a test of level 137 is expected. From where we can expect an attempt to continue the fall of ETH/USD and further development of the downward trend. The purpose of this movement is the area near the level of 130. The conservative area for Ethereum sales is located near the upper border of the Bollinger Bands indicator strip at level 140. Cancellation of the option to continue the decline in the rate of Ethereum will be the breakdown of the area of ​​the upper border of the Bollinger Bands indicator. As well as the moving average with a period of 55 and closing of quotations of the pair above the area of ​​142. This will indicate a change in the current trend in favor of the bullish for ETH/USD. In case of a breakdown of the lower border of the Bollinger Bands indicator bands, one should expect an acceleration of the fall of the cryptocurrency. 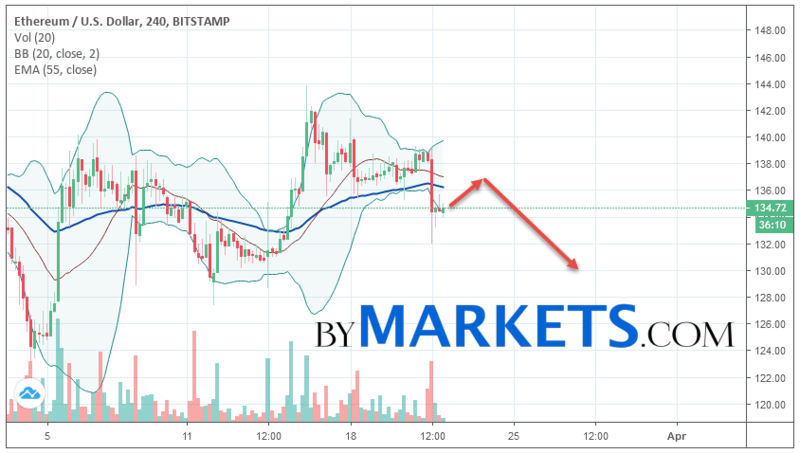 Ethereum (ETH/USD) forecast and analysis on March 23, 2019 implies a test of level 137. Further, it is expected to continue falling to the area below the level of 130. The conservative area for selling Ethereum is located area of 140. Canceling the option of falling cryptocurrency will be a breakdown of the level of 142. In this case, we can expect continuation growth.